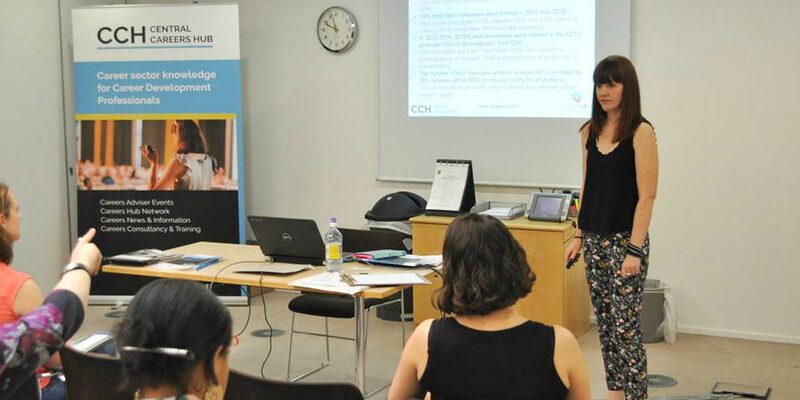 Careers Advisers Andy Gardner and Catherine O’Mahony of Central Careers Hub, hosted the Tech Careers Event on the 22nd of June at BCS, the British Institute of Technology, which was targeted towards teachers and careers advisers across London and beyond. Careers advisers play a very important role in young adults’ decision making. 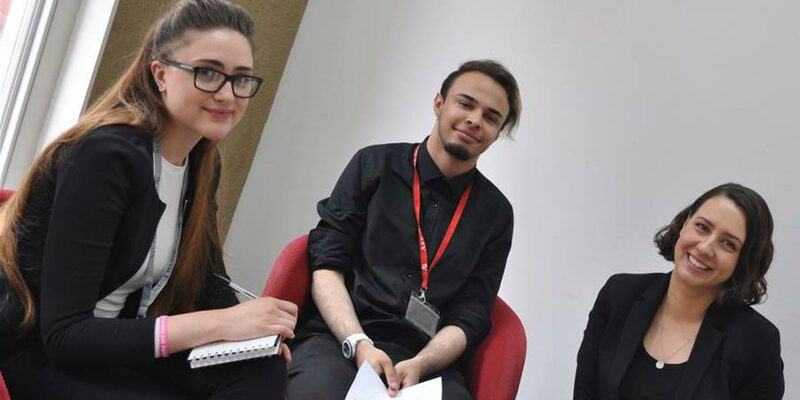 They are there to raise the aspirations of young adults, increase motivation and achievement, improve success for different sectors, and make students aware of their skills and capabilities. Without the right knowledge, students will be left with limited information to make a career choice. See below for the post-event survey! 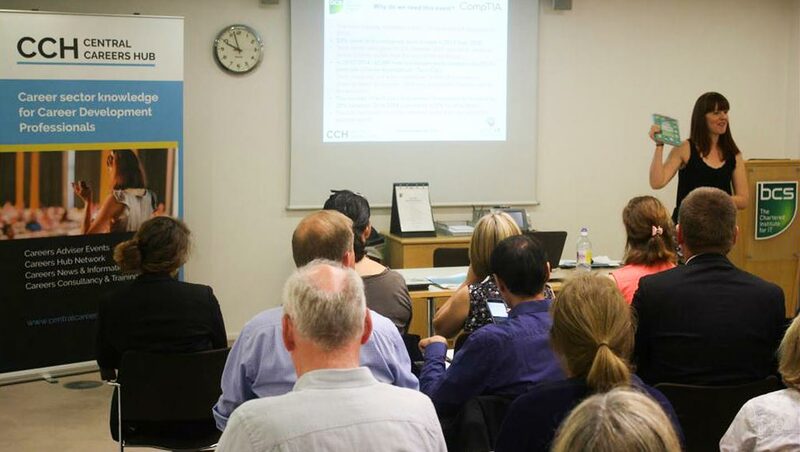 During the event we were about to find out more about the challenges careers advisers face when explaining tech, which is one of the main reasons why the event was so popular with careers advisers and sold out in two hours. There are hundreds of job roles within the tech sector and the languages are confusing such as Java, Python, etc. And what are the definitions of FinTech, EdTech, etc.? Careers advisers should have heard of DOTS (Bill Law and Tony Watts’ model for stages of career planning. It stands for Decision Learning, Opportunity Awareness, Transition Learning and Self-Awareness). And technology is no different. Andy and Catherine began to explain to us the meaning of the Careers in Tech VOTS framework, which stands for Verticals, Occupations, Technologies, and Skills. One of the biggest misunderstandings in tech careers, is that you do not need to know how to code to be successful (though coding is essential for software development). There are hundreds of opportunities within the sector, all that lead to great profitable careers where you don’t need to code. For example, the CompTIA A+ is a major qualification required for Tech Support jobs and this doesn’t involve coding. We went onto further research to see how many people in tech were successful with and without degrees, the highest percentage of success we saw was those who never went to university. To back up this point we had more guest speakers come to the stage to share their experience with us; we had two Just IT Apprentices (Rebecca Kitt and Chris Wheatley), a representative for CompTIA (Zeshan Sattar), an IT employee with Software experience (Barney Hanlon from Inviqa) and an apprenticeship provider (Simon Perriton, Founder of Just IT). Each one of these began to explain how they got to where they were today, often without a degree in Computing, what other certifications in IT you could take instead of a degree, explained the key difference between different tech job roles and other answered other questions from the careers advisers and teachers. 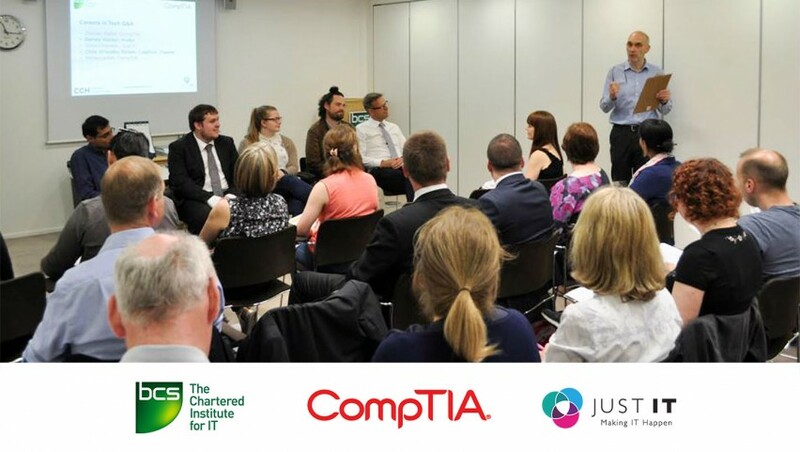 Getting careers advisers knowledgeable on tech career options is vital to the industry. By getting Careers Advisers and Teachers to understand Careers in Tech better, we automatically get the young adults they see to understand it better too. Look out for a free download of the “Cracking the Tech Careers Code” report which will be available from the CCH website in September. This sounds as if it was a really useful session which unfortunately I was unable to attend. However, from reading the report it has added to my oown knowledge and given me confidence to continue advising the young and teachers in particular about advising their students, particularly girls, of the merits of joing the tech crowd. It would be really helpful to have a slide presentation that could be taken into schools for use at staff meetings as well as career classroom sessions. Many career lessons are delivered by tutors/teachers with lack of understanding about this important sector of industry and they cannot always get out To such useful presentations. This was a really informative session. I made some really useful links and was able to disseminate really useful information to the rest of the team at Ealing. Thanks to Andy and all the team for a great presentation and good venue. Getting lots of positive feedback about the VOTS framework and work being put into Careers in Tech. It’s becoming very real for me as my own son is starting a Software Developers Level 3 Apprenticeship next week – have just done his UCAS withdrawal stuff.